Oberleutnant zur SeeWolfgang Grandefeld took his command U-174 into New England waters for a brief incursion in April 1943. ON the 22nd of April the sub motored west from a position about 200 miles south of Cape Sable, Nova Scotia. The following day, the 23rd, the boat turned 90 degrees to the north for a day, then spent two days – the 24th and 25th – patrolling a point roughly 150 miles southwest of Cape Sable NS,. Following that, the U-boat turned east and exited the area about 100 miles south of Cape Sable, heading east and to its destiny. U-171 acted in concert with U-161 and at the outset of the patrol had rendezvous with Axis blockade runners Regensburg, Pietro Orseolo, Karin and Irene. They met the ships west of the Azores and radioed their coordinates to headquarters. On the 25th of April both boats encountered an eastbound convoy south of Cape Sable NS but were driven off by escorts (Wynn, Vol. 1, p.132). 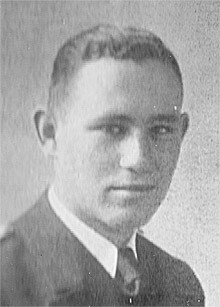 On the 27th, the day after U-174 exited New England waters, the boat was caught on the surface by a Venture aircraft of Squadron VP-125 piloted by Lt. T. Kinaszczuk. A battle ensued during which the aircraft was hit but send four depth charges at the sub from just 25 feet up. These went off under U-174 and one ahead of her. Initially the sub’s bow rose up and then she seemed to gain equilibrium before she sank by the stern, the bow turned almost vertical, and the boat sank. Canadian naval ships searched for survivors without success. (Wynn, Vol. 1, p. 132). Wolfgang Grandefeld was born in 1917 and was 26 when he died off Nova Scotia. He didn’t manage to sink or damage any Allied ships and was not decorated. He took over U-174 from Ulrich Thilo in early March 1943 and this was his first patrol aboard her. Early in his U-boat career he was watch officer of U-108 from April 1942. Before that he was in the 2nd Minesweeping Flotilla as well as the 5thMinesweeping Flotilla and he served in the 7th R-Boat Flotilla (Busch & Roll).